By Garett Sloane . Published on March 25, 2019. Apple News Plus features mostly magazines but there are some newspapers and digital publications, too. Apple's string of new subscription services pushes advertising mostly out of the picture -- but for the magazine industry that is a major partner in Apple's expanded news offering, there will be ads nonetheless. Apple on Monday revealed Apple News Plus and the Apple TV Plus video streaming service, both billed as premium media offerings that are different because they do not track consumers or sell their attention for ads. "This is a different approach than others have taken," said Apple CEO Tim Cook, who was referencing rivals like Facebook and Google, whose businesses depend on consumer data collection and advertising. 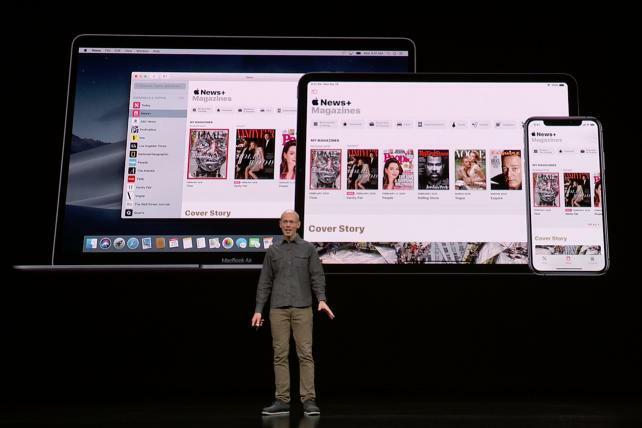 When Apple executives showed off Apple News Plus, a new subscription magazine service, the focus was on 300 glossy magazines but not the ad experience. "I love the feeling of being at the newsstand with all those beautiful and thought-provoking magazines covering so many topics," Cook says. Apple News Plus will cost $10 a month and give readers all the magazines they can read, which will contain all the same stories and photos from the physical editions. However, what Apple didn't show is that they will also have the same ads, according to Doug Olson, president of Meredith's magazines. "Every ad from the print edition will be in the digital edition," Olson says. "We think this is a great opportunity to bridge traditional magazine experience to the digital future." Apple is taking the same model from its free Apple News service as it pertains to selling ads, Olson says. That means that it won't allow advertisers to use highly targeted data collected about readers or retarget them elsewhere online when they leave the app. "They don't allow advertisers to track you," Olson says. Still, the magazines will be able to include the additional Apple News Plus readers in reports on audience sizes to advertisers, because the app is certified by the Alliance for Audited Media, Olson says. Apple will also open up ads in Apple News Plus, according to Olson, similar to how ads run in Apple News, giving publishers the flexibility to insert digital ads like they do in the free app. Publishers have the power to sell and deliver ads that appear in Apple News, although there are limited targeting options. Apple News Plus was developed from its acquisition of magazine app Texture. Troy Young, president of Hearst magazines, says that Apple News Plus can succeed where Texture fell short. Hearst was one of the founding publishing members of Texture, but the app delivered PDF versions of magazines — not a fast-loading digital version like Apple created, Young says. Apple also has a billion devices. "I thought Texture was pretty great myself, but it was a challenge," Young says. "It takes a lot of muscle to market it." There has been some pushback against Apple for the terms of its deals with publishers, which will only receive 50 percent of the revenue from their participation in the app, with Apple taking the rest of the monthly subscription fee, according to publishing executives familiar with the program. Some publishers were wary of signing up because of the fear that they would give away all their content while losing readers who might have subscribed to them directly. Apple did sign up The Wall Street Journal as one of the only major national newspapers to join the app, but The New York Times, The Washington Post and Financial Times were noticeably absent. Major publishers like Condé Nast, Hearst, Meredith, National Geographic and others were among the participants, as were a handful of digital-native publishers like Vox, Vulture, Grub Street and TechCrunch. On Monday, Apple also revealed its new Apple TV app, Apple Arcade video game platform and a new Apple Pay credit card. The new Apple TV combines all channels and video on demand into one viewing hub. So a person can subscribe to HBO, buy iTunes movies and watch Amazon Prime, for instance, in the Apple app without switching between all the services. There is also Apple TV Plus, which will feature a lineup of shows from stars like Steven Spielberg, Oprah Winfrey and J.J. Abrams. Apple is producing shows with the top Hollywood talent, and the streaming property will arrive in the fall -- without ads.